*PLEASE NOTE: Exchange items will be sent out via Royal Mail 2nd class post, please allow up to 7 days from receipt for your exchange to processed. Print and complete the Order Returns Form. You can return a product within 14 days of the date on which you received it and we will refund you any money which you have paid us for that product. The product needs to be in an ‘as new’ condition and complete with all packaging and components. All you pay for is the return postage of the goods. If you return a product to us that is not in an ‘as new’ condition we reserve the right return the product to you. If you receive an item from us which is faulty, which you did not order or for any other reason which is our fault, please contact us by telephone (on 01628 529206) or email (Lesley.sales@mailsports.co.uk) to inform us within 14 days of receipt and we will arrange a refund or replacement. We will refund the actual return postage fee up to a maximum of £5.00. Please note that you are welcome to come to our shop in Bourne End to exchange products bought via our website. 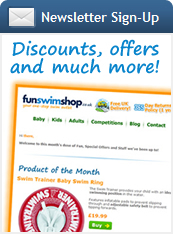 Please read the FunSwimShop Terms and Conditions.